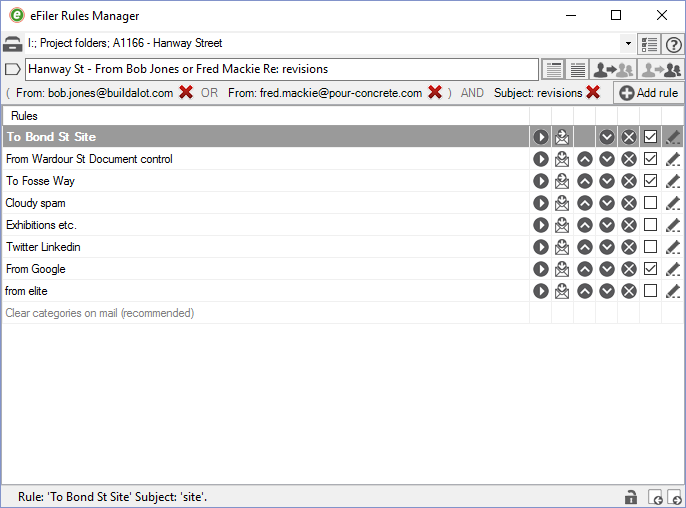 Use eFiler’s eRules feature to extend the power of Outlook Rules and automate a lot of your routine filing by making rules which file incoming and outgoing emails into network file system or cloud storage folders by matching text in the subject line, message body, or the names or email addresses of senders and recipients. Outlook supports up to about 150 such rules and they may be used either to process emails as they are sent or received or using Outlook’s “Run Rules now” function to take a lot of the legwork out of filing legacy emails. To increase the limit to around 600 eRules please see our blog post which gives instructions. The user interface is simple and clear, so defining eRules is intuitive and easy. As with configs and locations, eRules may be uploaded into your licence policy so that one person may define eRules which are automatically sent to all users.